We are an interdisciplinary innovation laboratory working to imagine, design, test, and implement pioneering approaches to legal empowerment. 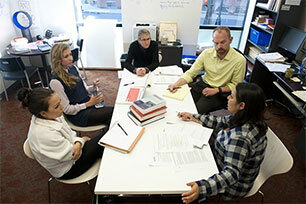 Partnering with individuals and communities to identify unmet legal needs and collaboratively design solutions. Because a community-based approach makes legal services and institutions more responsive to human needs. Cultivating knowledge and experiences from a mix of disciplines and social perspectives to shed new insight on longstanding barriers to legal empowerment. Because the most effective solutions are the result of true multidisciplinary teamwork. Transforming the legal profession by teaching lawyers to design new ways of connecting people to law, legal information, and services. Because the leader in experiential legal education is the best place to provide graduates with the skills and experience to lead the ongoing transformation of the legal profession.